Fayrefield Foods have been bowled over by support after staff were joined by former England cricketer Darren Gough on a 176-mile cycle ride in aid of Mid-Cheshire Hospitals’ MRI Scanner Appeal. The company has received a staggering £30,000 in donations – with the total still rising – after completing the Cheshire Cycle 70 Route over the August Bank Holiday weekend. 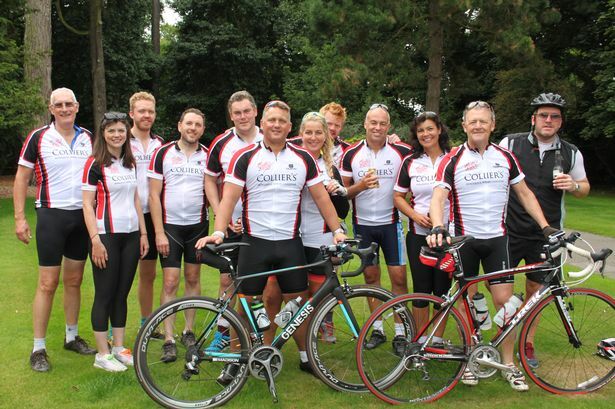 The 13-strong team was headed up by managing director Nick Hilton and cycled under the company’s award-winning ‘Collier’s Powerful Welsh Cheddar’ brand, of which Darren Gough is the ambassador. The circular course, which started and finished at Fayrefield’s head office in Englesea House, Barthomley Road, took them two and a half days to complete, with the team not only cycling to support the MRI Appeal but also in memory of Theresa Kerr – a former director of Fayrefield Foods. Darren recently completed a 300-mile charity cycle ride between the five Ashes grounds that hosted the 2005 Ashes series, raising £320,000 for charity in the process. Along the Cheshire Cycle 70 Route the team took in locations including Weston, Hough, Wybunbury, Audlem, Malpas, Chester, Ellesmere Port, Knutsford, Alderley Edge, Macclesfield Congleton and Alsager – with blocks of Collier’s helping to fuel them as they went. They were also supported by Ben from Community Recycle Cycles and Supreme Cycles, both in Crewe. Mid Cheshire Hospitals Charity launched its appeal last year with the aim of raising £1m for an additional MRI scanner at Leighton Hospital. The current scanner is working to full capacity and a new one is vital in helping to save more lives.